If you are wondering, why is this part 2 when there is no part 1, then that means you are missing my juicy stuff over on BGLH! 1. There was a video highlight on BGLH where Ouidad said that oil does not seal in moisture and generally recommended against its use as it suffocates hair. 2. I then gave a scientific response to this comment generally highlighting that science shows oil does have a sealing effect and does allow moisture (water vapour in air) to go through and therefore does not suffocate hair. 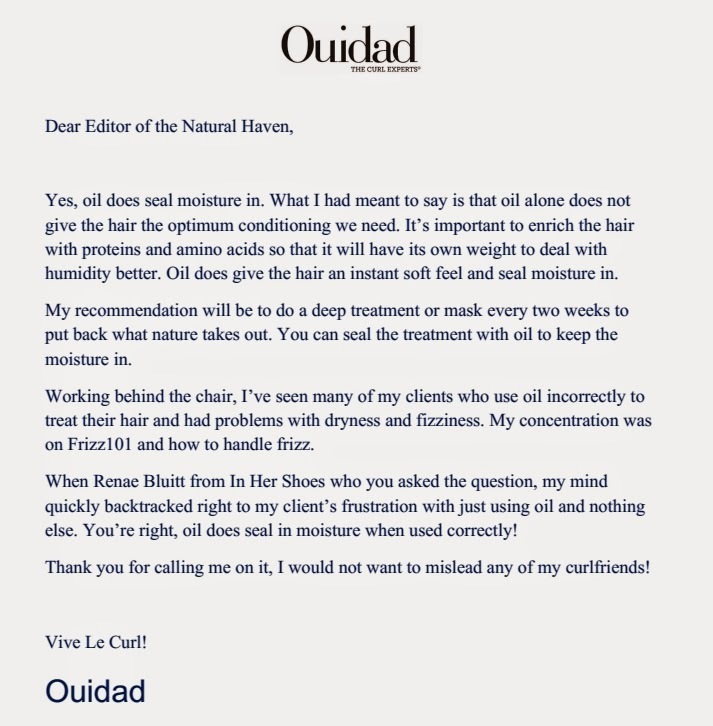 Well the folks over at Ouidad read the scientific response and wrote this letter to me. I am pleased that Ouidad has clarified what she meant. I know that some of you readers will be sceptical but I am not, I truly believe that knowledge is gained from being able to critically analyse things that you say (or type) and being able to acknowledge when you were wrong. I know that I have had to make corrections and clarifications on this blog and to me this is all part of the learning process. kudos to her. I know some people who just keep going down the wrong road because they don't want to acknowledge they were wrong. I have even more respect for her now. Yes there are many companies that I have dealt with who have clearly incorrect information (e.g giving a pH value to an oil) but they will never admit they are wrong. I think we are all here to learn and knowing when something you said was wrong or could be interpreted wrongly is part of the process. Wow...great job!! That was very big of her to do b/c she didn't have to. Kudos JC! And I'm actually proud of Ouidad for handling this with grace! Great, that a specialist can admit that she made a mistake. I followed the debate from the beginning and in the end all that she meant to say is: 'Oil (one itself) isn't a moisturizer!'. I have used oils properly (to seal in moisture) and improperly (as a moisturizer). When I was new to natural hair products and routines, the emphasis was using oil as a moisturizer and a sealant. I learned from trial and error, that I have to moisturize my hair first, then I can seal with a little oil. Otherwise, my hair was dry and greasy. We all (even the experts) sometimes react to quickly or misinterpret information. As long as we correct each other with respect, as with the Ouidad/BGLH/Natural Haven, everyone is better served. Great job on straightening out a misleading information. The internet has its way of reaching such a large demographic, and it's very helpful to give off the right info. It was also great for Ouidad to admit that the statements released might actually be mistaken and interpreted for something else. Kudos! Viva la kink, coil, curl, wave and straight using oil as a moisture aid not moisturizer. Thanks for this! I wish more people understood this concept. I have a few natural women im in my circle who are always applying oil and complaining that their hair is dry. My natural circle of women are still afraid of using water which will add the moisture. Thank you for sharing this! I originally read Christina Patrice's piece, but missed your post. I pretty much give you authority on the science of our hair. Many thanks!